If you haven't seen the movie, this is your last chance to get out of this page before you see what I wrote, which will spoil the ending and lots of plot bits! 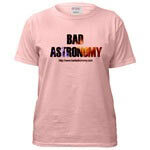 Here's the short version: "Armageddon" got some astronomy right. For example, there is an asteroid in the movie, and asteroids do indeed exist. And then there was... um... well, you know... um. Okay, so that was about all they got right. Now I know that accuracy was not the main point of the movie, and clearly from the way the plot played out, realism was the last thing on the minds of the writers. One person who emailed me said the movie had "sub-comic book level science" which is pretty much right. But as always, I can use their Bad Astronomy as a jumping off point for some Good Astronomy. Shall we start? In the opening sequence, we see an asteroid headed for Earth, and are told that this was the Dinosaur Killer 65 million years ago. The narrator says that it exploded with the force of "10,000 nuclear weapons". Interestingly, the dinosaur-killer segment was narrated by none other than Charlton Heston. In 1996, NBC aired a TV show called "The Mysterious Origins of Man", a fringe-science show ostensibly about unexplained aspects of science, but in my opinion simply a front for a lot of pseudoscience. Anyway, it had a segment about the Paluxy River tracks, which are supposedly a set of dinosaur footprints with human footprints superposed on top. This turns out not to be the case (see, for example, a web page by Glen Kuban about them). Anyway, I find it odd and vaguely ironic that Charlton Heston narrated both the dinosaur part of "Armageddon" and a TV show saying that humans and dinosaurs coexisted. You may make of this what you will. The director of NASA, Dan Truman, says that the asteroid, "the size of Texas", was knocked out of the asteroid belt by a comet, which is why it is headed our way. Yegads. First off, there are no asteroids in the solar system that big. We'd have discovered them ages ago; Ceres, the largest asteroid in the main belt, is about 900 kilometers across, and Texas is about 1400 kilometers across. Even if we assume the size is an exaggeration, it still doesn't wash. A comet could not simply impact it and knock it out of orbit! An asteroid with a radius of, let's say, 500 kilometers and made of iron (as was said many times in the movie) would mass about 5 x 1024 grams, or five million million million tons. That's a lot of asteroid; you could ram it with comets for years and not move it much. Plus, the odds of a comet hitting an asteroid at all are very slim. I have hashed this out in my review of the movie "Asteroid" as well. Incidentally, the real director of NASA is named Dan Goldin, and I have to think the similarity was on purpose. I am not implying anything here; I think they were just going for some extra realism by giving the character almost the same name! The big asteroid is preceded by lots of little ones which hit New York City, Paris, Shanghai, etc. etc. It is possible for the Earth to be pelted by forerunners of the main asteroid, if the initial impact with the comet sent shrapnel flying. But that shrapnel would dissipate quickly (as it expands, the volume of space it occupies increases very rapidly, and the debris thins out), and most likely by the time the shrapnel reaches the Earth, very little would be left. But even given that, if there is any advance shrapnel, then it would not come in episodes, but instead be a continuous rain of debris. Not only that but the average size of the debris will increase with time until the big one hits! Why is that? Because, in an explosion, lightweight stuff gets thrown faster than heavier stuff. Since it is faster it reaches the Earth first, before the heavier stuff. There is a broad range in the size of the debris, so there should always be stuff hitting the Earth as the debris cloud expands. And since the bigger stuff moves slower, it'll hit after the light stuff. In the movie, we only see a few episodes of collisions, although there is a very large hit late in the movie. And another thing: why do movie asteroids only target big cities? I bet Ithaca, New York got hit too, but I guess watching students from Cornell running around in panic isn't as much fun as watching a guy and his dog in the streets of Manhattan. I will say though that the Paris sequence was very well done. Sacre bleu! The asteroid is completely missed by everyone on Earth until it is only 18 days away. When asked why NASA didn't see this coming, the director says (paraphrasing) "We only have a million dollars to search the whole sky, and it's a big sky". Later, they use Hubble to view the asteroid. Well, it is a big sky. Big professional telescopes only look at relatively small chunks of it... at least, until a few years ago. Now, there are surveys underway to look for any asteroids out there headed our way. But even discounting them, there are tens of thousands of amateur astronomers, bless them, who look at the sky every clear night. Could they have missed it? Let's see. Let's say our killer asteroid is the same size as Ceres (remember, 900 km across). The movie says it is moving at 22,000 miles per hour (not metric, of course! ), and is 18 days away. That puts it about ten million miles away, or 40 times the Moon's distance. At that distance it is 30 times closer than Ceres. Ceres itself is just barely too faint to seen by the naked eye, but if it were 30 times closer, it would be 900 times brighter! [Note: actually, it would be even brighter than that. Since it would be closer to the Sun, it would receive more light from the Sun, making it about four or so times brighter, plus the 900 times, making it about 3000-4000 times brighter than Ceres. My thanks to Bad Reader Craig Berry for pointing that out to me!] That would make it one of the brightest objects in the sky. Even if we were to assume it was farther away, like 60 days from impact (two months), it would be ten times brighter than Ceres, and an easy naked eye object to spot. Anyone familiar with the sky would spot that easily. Incidentally, they said in the movie that only 15 telescopes in the world could spot the asteroid. As I have just shown, there are billions of unaided eyes that could have seen it as well. We get a good look at the asteroid. It is rough, jagged, with lots of spikes. It is surrounded by vapor. When an object gets to be a certain size, the strength of its own gravity tends to shape it into a sphere. Why is this one jagged? I have heard some people say it's because of the comet collision (which in turn means the original asteroid was even bigger!) This doesn't work for many reasons. First, a collision big enough to send something that large our way would melt the whole thing too. It would easily form a sphere if it had melted. Second, relatedly, the asteroid was not even hot when it got here. It wouldn't have had sufficient time to cool in 18 days (or however long it took to get here, really). The vapor was weird. I suppose an asteroid can have pockets of gas deep inside (the boundary between comets and asteroids can be blurry), and they even say as much in the movie too (holy cow, they got something else right!). But the gas is shown as red and green. Nebulae, or gas clouds, in deep space have color, and do look red and green, but that is due to their being excited by a source of ultraviolet light. The asteroid's vapor would look white to the eye, because it is lit by reflected sunlight. No big deal, but it's just another dramatic effect added with no real scientific content. This is just Bad. During the X-71 launch sequence, they used real Space Shuttle footage, and used computer graphics to stitch the image of the X-71 onto a shuttle rocket stack. However, at least once during the sequence, you could see they forgot or didn't bother to change the Shuttle to the X-71. They just left the video as it was, and you could clearly see that it was a real Shuttle, and not the X-71. This reminded me of the old TV show "I Dream of Jeannie", when they would show footage from two or three different rockets whenever Captain Nelson went into space. You'd see an Mercury rocket miraculously change in to a Saturn. I laughed out loud in the theater when I saw that scene! Just before the X-71's dock with the "Russian space station", the cosmonaut sends it spinning to give them gravity. Arg! A scene chock full of bad science. First, a spinning station would be very difficult to dock with. The X-71's would have to basically fly in big circles to match velocities. The real Russian station, Mir, does not spin, and docking is still a delicate procedure. Remember, the biggest near-disaster with Mir occurred when a rocket tried to dock with it. No docking is routine! Spinning the station would make docking tremendously harder. Then, after they dock, what is holding the X-71's to the station? All you see is a little tube connecting them to the station. That little tube could not possibly hold the ``weight'' of an X-71 against the spin of the station. Now, when you rotate a space station, you would feel a force outwards, away from the center, just like when you round a curve in a car. This would feel like gravity. During the next scenes, gravity goes every which way, basically whichever direction was convenient for the script. At the center of the station, incidentally, there would be no force at all! The force outwards that you would feel in a spinning space station is the product of how fast it's spinning and how far you are from the center; the farther out you are, the stronger the force. At the center, you are at zero distance (by definition!) and so you'd feel no force. There'd be no gravity! The Big Plan is to split the asteroid in half far enough away from the Earth that the separating halves will both miss. This must be accomplished four hours before impact. Imagine the asteroid four hours before impact. Each half must move away fast enough to cover 6400 kilometers (the Earth's radius) to miss the Earth. Anything less than this means an impact. In turn, this means each half must be accelerated to a speed of 6400 km/ 4 hours=1600 kilometers an hour. That's about 1000 miles per hour, or about twice as fast as a passenger jet. But wait! This asteroid is 1000 kilometers across! It is extremely massive, and something with that much mass would take an enormous amount of energy to get moving that fast; about a hundred billion megatons, or very roughly the same amount of energy the Sun produces every second. Needless to say, one bomb ain't gonna do it. A billion or so might though. I don't think even Bruce Willis is up to that task. After the asteroid passes the Moon, a technician says the Moon's gravity has sent the asteroid tumbling, and soon the astronauts will be out of communication range because they will be rotated away from the Earth. Amazingly, this can actually happen, though not the way they mean. The Moon's tides will put a torque, or twist, on the asteroid, which can indeed make it spin. Basically, the strength of gravity depends on the distance you are from whatever is pulling you. The asteroid was big, and passing close to the Moon. One part was a lot closer to the Moon than another, so got pulled harder. As the asteroid swung around, this would act to try to get the long axis of the asteroid pointed towards the center of the Moon. That might actually cause the asteroid to spin a bit. In my opinion, the writers needed Yet Another Plot Device, so they threw this in, not knowing that it was actually possible. The asteroid is big enough to have some gravity, so the people can walk and drive on the surface, but the gravity is so light that they need thrusters working in their suits and vehicles to keep from flying away. Inside the ship, though, people walk normally without suits. Oops! The writers forgot that gravity can penetrate even the "impenetrable titanium" of the rocket's hull (if that's true, how come Ben Affleck's character could shoot a gun right through the hull to get out?). We also see the pilot running around the ship. Every time she ran she should have launched herself against a wall. Ouch! Even more, one of the armored armadillos launches itself across a canyon, with the astronauts inside hoping to use the thrusters to push them back down when they get over the other side. They hit some rocks and start spinning, and then use the thrusters. This somehow gets them back down, when actually it would send them corkscrewing and not just spinning. If they touched down, it would be a big coincidence if it were right side up! The astronauts need to bury the bomb inside the asteroid to magnify the effect of the explosion. They need to get it 800 feet deep, so they drill a hole to plant it. One other thing: if time is of the essence, and they have to dig 800 feet down, why did they dig at a 45 degree angle?! That added an extra 320 feet to their drilling. What they should have done was ram one of those X-71's straight on to the asteroid. That would have created a crater much deeper than that! They wouldn't have had to dig so far. As the final hour approaches, suddenly there is a series of explosions, with rocks flying everywhere! There are also huge gales that threaten to kill the astronauts. Well, tides from the Earth would tend to stress the asteroid quite a bit. That might loosen rocks, causing a rock storm. It might it even open up vents deep into the asteroid, letting gas out. But that gas would escape vertically, not horizontally. The gravity of the asteroid is too weak to hold on to the gas moving that fast. A military man at some points calls "NASA" "Nassau". This same thing was done in "Doomsday Rock". Twice in the movie a monitor at NASA shows the Hubble Space Telescope; once at the beginning during a satellite repair mission, and again when the astronauts are planting the bomb. Wouldn't you think NASA would have something better to put on their screens when they have a huge, expensive all or nothing mission running then some random satellite? In space, Shuttles, even X-71's, would not fly like planes, or X-Wing fighters! There's no air up there, so the rockets can't bank around curves. Those rocks were so dangerous flying towards the asteroid that one of the X-71's was destroyed, yet the second one can leave the asteroid before the bomb blows up and the rocks are gone. And just what is the minimum safe distance from the asteroid when it blows up? Shrapnel from the explosion would have destroyed the rocket! Sigh. My personal opinion of the movie science was of course low, lower than even I thought before seeing it. But I also thought the plot was vapid, the direction awful (it was like an extended car commercial, someone pointed out) and had so many ridiculous things in it that I had a hard time enjoying the fun of it. It was fun, but even that was hampered by the sheer over-the-topness of it. I never once had the feeling that the Earth would be destroyed, so all the drama of the impending doom was gone. In "Deep Impact", after the first half of the movie, you never once forgot what was going on; the sense of doom was palpable, so much so that my heart was pounding during the impact sequence. In "Armageddon", the drama never existed. One of the most important aspects of a film, especially a science fiction, is the suspension of disbelief. Once you get that "Oh, come on" feeling, I disengage myself from the movie a bit, and the fun drops. I was disappointed by this movie, and not just because of the scientific ludicrousness. I just watched a special behind the scenes look at the movie aired on the cable channel "E! ", and in it the technical advisor for the movie said "a number of ideas [before the final film was shot] needed to be changed to be physically realizable..." I wonder if he meant filmable, or actually physically better than what they started with. If the latter, I wonder how more cartoonish the movie might have been originally!